Off-site content marketing initiatives can be extremely effective for creating brand awareness and leading traffic back to your site. But once visitors arrive on your site, they won’t stay long or take the desired action if your on-site content isn’t designed with engagement in mind. If your content marketing goals include growing your audience, increasing conversions, or gaining new customers, you need a strategic plan in place to engage your site’s visitors. In addition to increasing the time visitors spend on your site, engaging on-site content helps warm prospects and move them through the buyer’s journey. It can also increase the number of return visitors to your site by building trust and giving people a reason to keep coming back. On-site content also comes with SEO benefits; it helps improve organic rankings by providing fresh content to search engines. And increased rankings means you’ll start seeing more traffic coming from organic search. Let’s look at a few types of on-site content and how brands are using these content formats to accomplish certain goals. Each of these examples shows you how different types of on-site content can fulfill a variety of content marketing goals. One of the most commonly seen types of on-site content is blog posts. This popular content type satisfies both search engines and readers. It’s both fresh material that appeals to search bots and the interesting, useful information that provides value for readers. The Buffer blog is a prime example of how to leverage blog posts to attract attention. Buffer is a social media management tool that helps its users be more productive. Buffer reinforces its focus on social media management and productivity by publishing extremely detailed resources on its blog that help its target audience solve their pain points. These posts keep readers on its site and draw in extra traffic. They are often shared because of their high value. 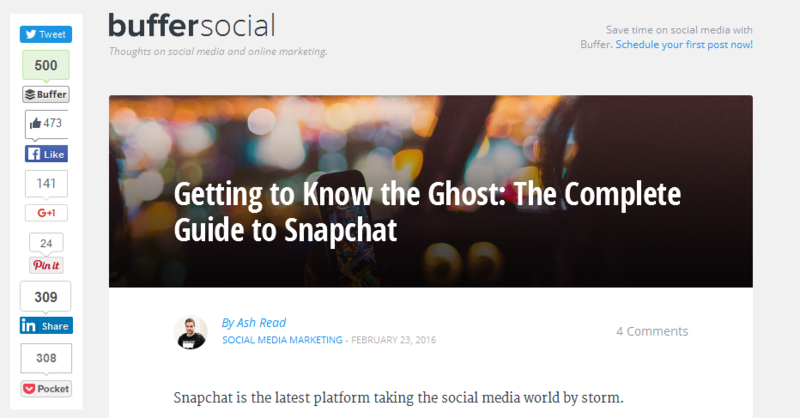 Buffer also takes advantage of using its content to encourage readers to take the next step in the buyer’s journey. On the blog, Buffer displays an unobtrusive pop-up box in the right-hand corner of the page with a call-to-action to check out its product. Then, at the end of its posts, Buffer holds its audience’s attention by inviting them to stay on its site. Buffer’s posts end with a list of related blogs that offer a path to learning more about the primary topic. Ultimately, Buffer uses blog content to attract and hold attention as well as lead audiences through the buyer’s journey. You aren’t required to give all of your content away for free in order to capture attention on your website. Audiences are often willing to share their contact information in exchange for in-depth e-books or guides. And customers actually crave this type of freebie when considering whether or not they’ll do business with a brand. More than 50% said that offering free content is an effective way to earn their business. Kissmetrics uses this to its advantage. 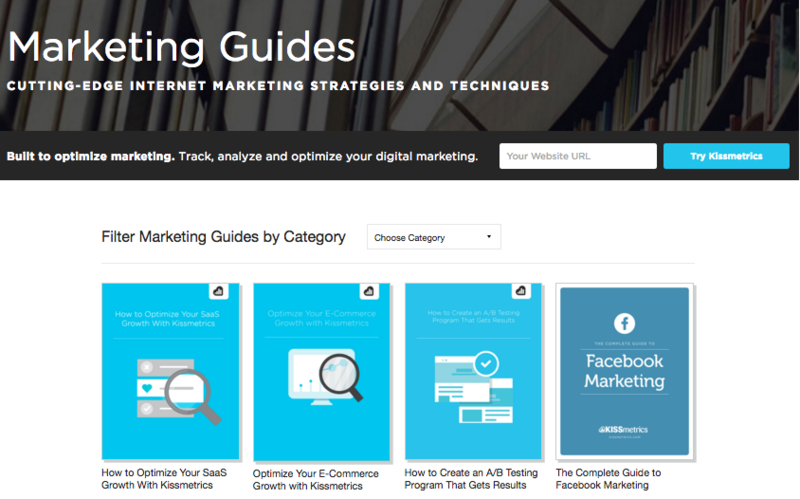 It offers a library of dozens of marketing guides free for downloading. 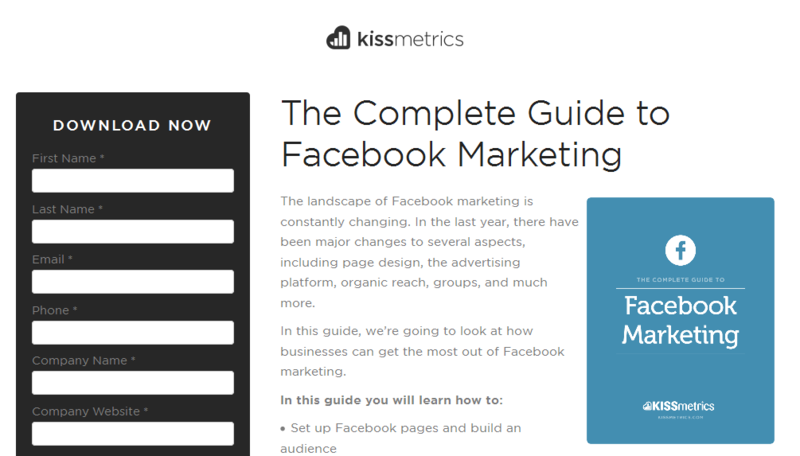 Kissmetrics offers value-packed, high-level guides that show off the brand’s industry expertise. Giving guides away for free allows Kissmetrics to show generosity to its audience while putting its authority on display. Even more, for every downloaded guide, Kissmetrics gains a valuable lead. It collects information it can later use to guide the reader through its sales funnel. The Kissmetrics guide library is a good example of how brands can give away free content and show off its authority while collecting valuable leads. Similar to guides and e-books, white papers are downloadable content available to audiences in exchange for their email addresses. But unlike guides and e-books, white paper resources often sit near the end of the sales funnel. The topics usually relate to solving a problem or providing information that a lead needs to make a purchasing decision. Brands that see this opportunity in the buying cycle can provide free white papers to help their audience through this process. Digital Signage Today does this extremely well. 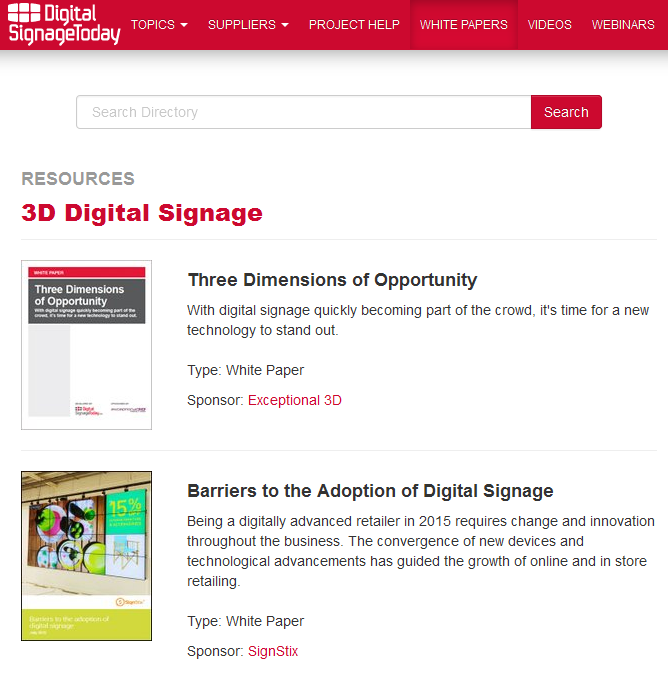 The digital media provider publishes hundreds of white papers on dozens of topics related to digital signage and curates those publications in a comprehensive resource section on its website. This not only provides a valuable resource for its audience – as readers know where to go anytime they need detailed, expert research and advice – but it also shows the brand’s industry authority. Plus, it provides a path to collecting valuable lead information. By having a variety of white papers that solve unique problems, Digital Signage Today can target its leads’ needs and better direct them through its sales funnel. Digital Signage Today shows how providing expert, authoritative content that speaks to prospects near the end of the buying cycle can be a prime way to categorize and draw in leads. Giving audiences detailed, high-level content without requiring an email address can also benefit a brand. Providing useful and engaging buyer’s guides on your site gives your audience a valuable resource that holds their attention while walking them through the buyer’s journey. This Fanatics Jersey Buying Guide is an example of how to use buyer’s guides to usher customers through the purchasing process. The interactive, beautifully designed guide answers many of the questions customers have when buying jerseys. Then, as the information guides users through its questions, it consistently presents opportunities for customers to put what they know to practice and purchase a jersey. Calls-to-action to take the next step in the buyer’s cycle are strategically placed throughout the content. The Fanatics Jersey Buying Guide is a good example of how you can create on-site content for the end of the buyer’s journey that leads customers to make their purchase. People are visual creatures. A study by MIT found that people can process an image in as little as 13 milliseconds. Our brains interpret information delivered through images, graphics, and charts far faster than through text alone, which is why people are drawn to infographics. Infographics provide visual stories that people love, help break down complex data into simple stories, and are often widely shared – making it an ideal medium for on-site content. 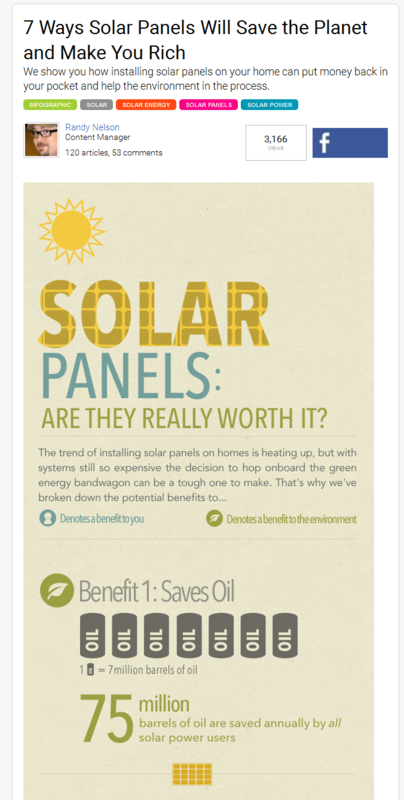 In this infographic 7 Ways Solar Panels Will Save the Planet and Make You Rich, Movoto took data and used it to tell a visual story that relates to homeowners, its target audience. Movoto then gave legs to the infographic by including a code at the bottom of the post, welcoming other publishers to post the infographic on their sites. The infographic is on-site content for Movoto, but it serves double duty. When other publishers share the infographic on their sites, they help Movoto increase awareness about its brand and send traffic back to its website. Publishing infographics on your site and making it easy for other publishers to post it on their sites is a good way to get dual benefit from one piece of content. Digital content that enables users to interact with it and customize the viewing experience can drastically increase the amount of time audiences spend on a site. 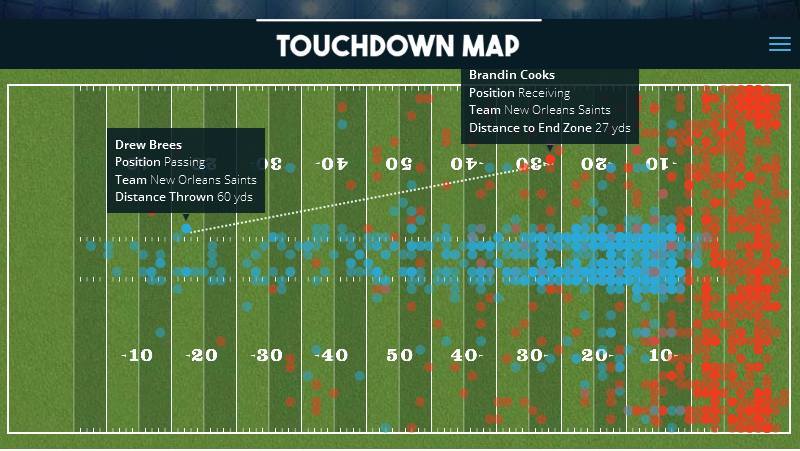 The Touchdown Map we created for Fanatics is a great example of how to use interactive infographics and apps to catch and hold the attention of your website visitors. The interactive infographic allows users to select players, teams, and games to see a visual representation of all of their touchdowns. With so many combinations, the graphic makes it easy to stay on the page for a long time. The long amount of time that users spend on the page is a benefit to Fanatics; the logo is placed on the page, which increases Fanatics’ brand awareness as the audience engages with its graphic. The Fanatics touchdown map is a great example of how delivering interesting data and giving an audience the ability to control it can keep audiences engaged and on a site longer. Like interactive apps and infographics, quizzes are another fun way to capture attention and increase audience engagement on a site. Quizzes give control to your audience and allow them to direct the results on the page, which increases the amount of time they’ll spend there. BuzzFeed is one website that regularly uses this type of content. It has an entire section of its site dedicated to quizzes. 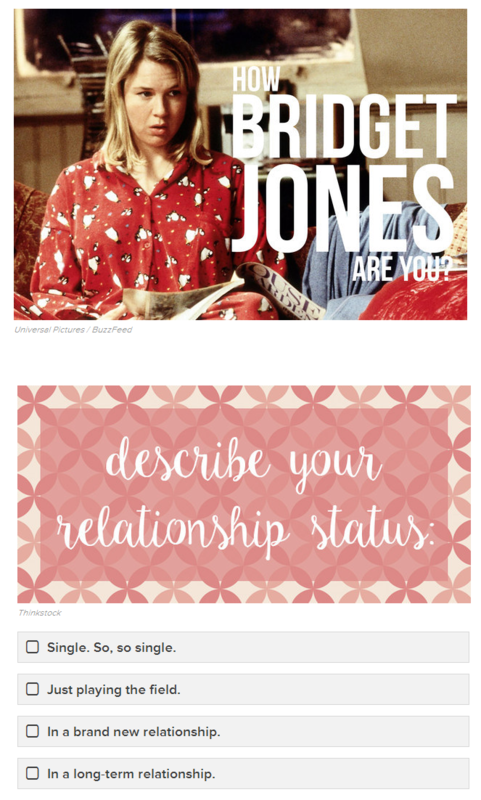 BuzzFeed’s quizzes often offer the audience a chance to look at themselves from a unique perspective. 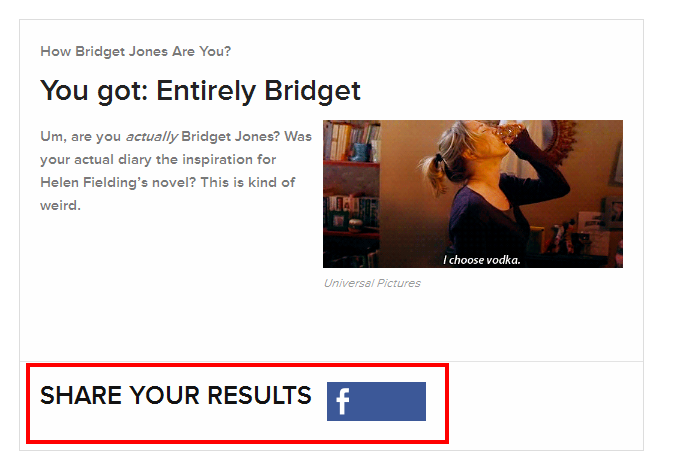 Delivering custom results with quizzes, like How Bridget Jones Are You?, make it fun and personal for audiences to engage with the on-site content. Plus, quizzes also help with collecting information about your audience. You can capture their results to learn more about them. And you can add sharing features that encourage your audience to post the results and spread awareness about your website. Quizzes provide audiences with content they love, help draw traffic back to your site, and collect information about your readers. On-site content that helps audiences solve problems or make their way through a complicated task or project is an effective way to attract and keep attention on a page. 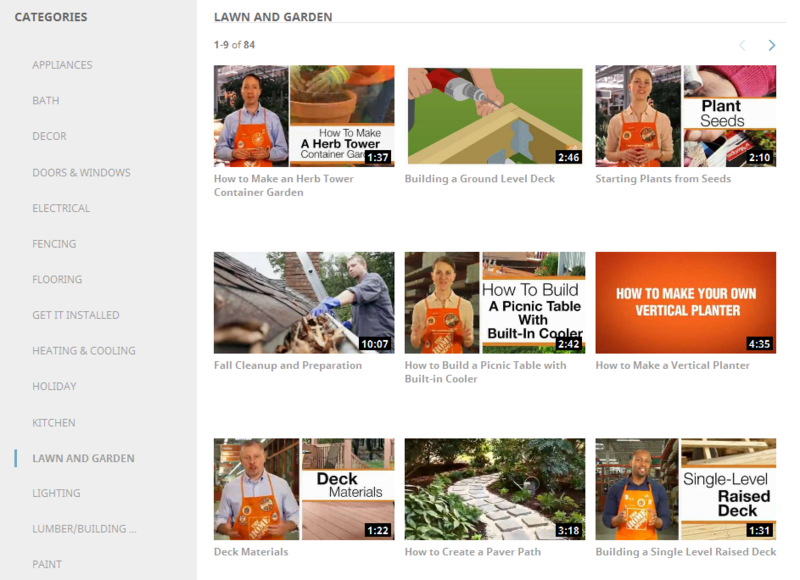 Home Depot uses how-to content to help solve its audience’s problems while introducing them to its line of products. The home improvement brand has a large on-site resource with dozens of how-to videos and tutorials. Each video explains how to perform a task and also includes a reference to products that will help the audience go through the project. Calls-to-action to shop for projects regularly appear next to its tutorials and videos. The Home Depot tutorial library shows how you can provide valuable information your audience needs while continuing to support your overall goal of turning readers into buyers. Last on our list is another type of long-form content. Publishing case studies on your website allows you to share real-life stories about the success and results of work in your industry. We have an entire library of case studies published on our site. By sharing these case studies, we show our audience how we help clients reach their goals and the types of results we achieve. This educates our audience, shows off our authority and expertise, and draws prospects a step closer to working with us. Each of our case studies also includes a clear call-to-action so after our readers have seen our work, they can get in touch to learn about working with us. Showing examples of your work through case studies is powerful as it allows your prospects to look closely at your business to decide whether or not your brand can serve their needs. As you can see, the different types of on-site content can help you reach multiple goals and benefits that range from improving SEO, increasing conversions, and building your brand’s authority. But most importantly, on-site content completes the cycle of content marketing by capturing the attention of site visitors, establishing a deeper relationship with your audience, and turning audience members into customers. So make sure you are putting as much energy into creating great on-site content as you are into producing awesome off-site content if you want to experience the full benefits of content marketing.